Don't know who Cary is? Meet her in A Tiny Tail for Mother's Day. Most mornings Cary is calling out to me long before I reach the barn. I still greet her with a bottle of milk, and once she has sucked it down, and the rest of sheep have been counted and are headed down the gravel drive in search of breakfast, we give Donkey Doodle Dandy his morning treat and tend to any barn chores. Then we meander out to the front field together to find the sheep. We stand among them while I breathe in the beautiful scenery and slowly look everyone over and Cary nibbles on grass. The sheep are always busily eating in a way that manages to be at once frantic and serene. This morning, after assuring myself that everything was right, I continued to walk past the flock toward the next field, checking behind me to make sure Cary was following along. She wasn't. She was several yards back, standing among a group of sheep, happily grazing. I called her name, and she looked up and gave me a small "Maaaa!" bleat in return. Then she went back to eating, her actions clearly saying, "I know you're leaving, but I'm supposed to stay here." 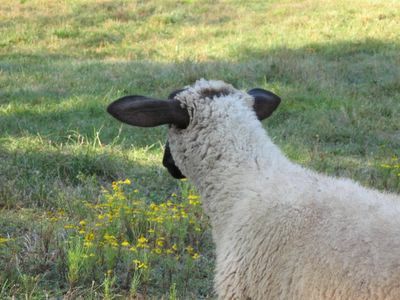 As I continued to walk along without her, I thought about how much less affectionate she has become, how for the most part she has turned away from me and toward her flock. And just as the words and that is as it should be played through my head once again, I looked down and saw a beautiful heart rock unlike any other in my collection. I picked it up and slipped it into my pocket, rubbing my fingers along its smooth surface, grasping its weight in my hand, feeling its physical presence. Cary isn't rejecting me; she's simply growing up, as all little lambs must do. I had no idea I would be so affected by this. But I do know that I will always be in her heart, and she will of course always have mine. Want to get to know Cary better? You'll find lots more photos of her here. That fuzzy woolly head is just asking for a kiss - mmwwah! In some ways I am sorry Cary has grown up so fast. I have enjoyed her stories as she has grown from limping baby to full grown ewe. 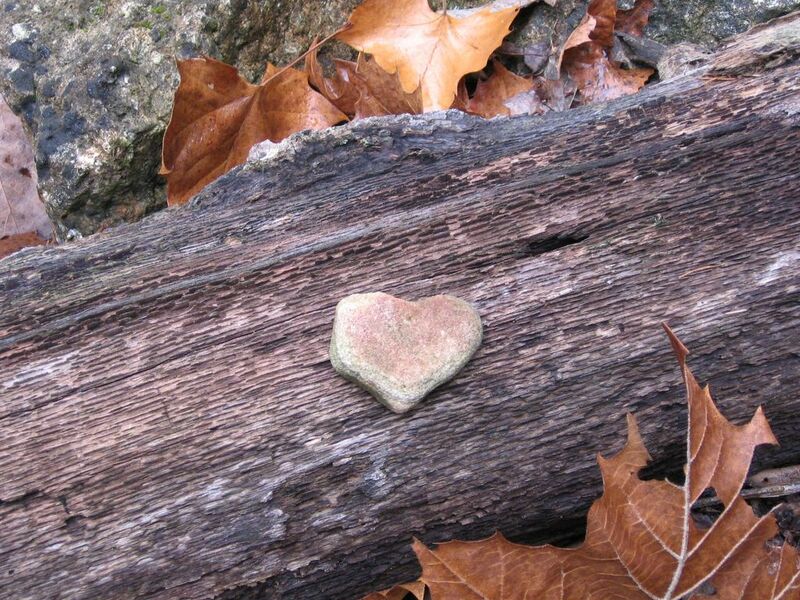 Finding your heart rock may be a "sign" of change being as they should be? I do hope so. It is a beautiful heart -- but then you have a beautiful farm and heart of your own. Awe! I feel that way about my 13 yo dd. Damn! You're entry today put tears in my eyes. Maybe I'm relating to the fact that my kids are now all on the other side of their teenage years and I sort of miss them like that...dunno. But it had me all misty for a while. So sweet! Now I'm brushing away tears, too. You are a successful mom, FarmGirl. You raised your baby sheep so she'd be a well-adjusted member of the flock...you did a great job. The heart rock is indeed a sign. Definitely warms my heart on this rainy and blustery morning. Great story to wake up to!! Sniff, sigh -- what a wonderful picture and story. Oh Susan, you've made me tear up! (In a sentimental way, and not the first time)It's so sad that Cary is growing up...but at the same time it's a success story. You've been a wonderful "maaaah". Thanks again for sharing your stories with the world! ...damn they grow up fast! Beautiful moment and retelling...you have a knack with the heartstrings...! Awwww, what a sweet story. Love the rock. I recently found a rock similar and gave it to my dd10 to carry on test days at school. She's a worry wart, so she can rub it and know Mom is thinking of her. I have really enjoyed the Cary stories; the picture with this post so perfectly captured the feeling! How bitter-sweet! You definitely did the right thing, raising her well, but of course it's hard to have lost your little shadow. All the best! Awwww.... 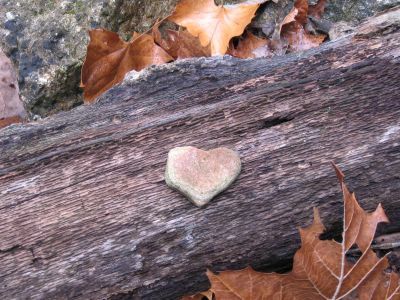 Wonderful the way the world provides those heart-shaped rocks (or other signs) just when they are needed, eh? Oh Susan, I hate you sometimes. I'm now sat here with tears on my chin. I have a heart shaped rock here on my desk, picked up from our beach on the morning we heard of that terrible shooting at an Amish schoolhouse. Ironically it has a hole straight through the middle and I thought of the many hearts broken that day. What a great story. I also grew up on a farm. We had sheep cats, dogs peacock and chickens galore. You tug at the heartstrings alright. Keep up the great stories..by the way I added your blog to my list. So I can enjoy more of these wonderful stories. Yup, you made me cry. I'm a sucker for animal stories. It's sad to see Cary growing up but also amazing and wonderful. I don't have children but I imagine it's how every parent feels--sadness and happiness all in one. I love Cary and I only get to read about him. Susan, You did a wonderful thing when you decided to become a mom to a lamb. I think you both were very lucky. Thanks so much for sharing your story. Aww. All our kids must grow up eventually. But I am finding out that they all eventually end up coming back home too. I have tears in my eyes! It's like how I felt about my sons when they finally grew up and moved away. They weren't rejecting me, but making a new life for themselves. Every mother goes through this. It doesn't matter if your baby is a lambie or not. Proving once again that Nature is wiser than us. What a magical moment. It's so sad that Cary has to grow up, but it's wonderful that she has found her flock, and presumably they have welcomed her with open arms. Thanks for sharing! Ah - Bless you both - Cary doing what God designed her to do - be a lamb and you doing what you were designed to do - be a joy to so many readers! Having animals is a cool responsibility - we lost a young doe goat last week to a predator and amazed at how we miss seeing little Glory running across the front pastures with the other young goatkin. Hey Cary - live it up - you've got that human wrapped around your lanolin rich little ears! That is so sweet. It gave me goose bumps. Sometimes it soothes the soul to find that one special sign that tells us things are as they should be and all is right in our own little corner of the world. P.S. Have you ever read the children's book OUR ANIMAL FRIENDS AT MAPLE HILL FARM? That is so beautiful, I feel a tear coming to my eye. You have such a kind heart! I feel your sadness but at the same time it's so good to know Cary is becoming part of the herd. It's all so amazing, I think. I want my own heart-shaped rock too! I love Cary stories. I knew this day would come (and in fact I've been waiting for it). Still makes me sad. You are so very pragmatic about it though. amWell now you've gone and done it again....made me tear up! Isn't it sad that the only thing we can count on is change....I know people say "that's as it should be" but that doesn't make it any less heartbreaking. Oh, that choked me up! Beautifully written. That's so wistful. But it really is wonderful that the flock is accepting her, so you've done everything right. I'm sure there's that dull ache in your heart right....HERE. "But what I can promise you is that I will always love you with all of my heart." Keep rubbing that stone.